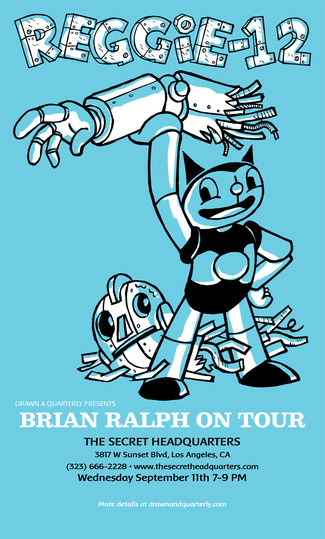 This Wednesday, September 11th from 7-9 PM, join Secret Headquarters and Drawn & Quarterly for an evening with cartoonist Brian Ralph (The Cave-In, Daybreak) to celebrate the launch of the highly-anticipated Reggie-12, a hilarious pop-culture send-up of the infallible boy hero first presented in the seminal Asian culture magazine Giant Robot.Reggie-12 is a young robot with endless enthusiasm. He lives with a bumbling sad-sack friend, a wise-cracking cat, and a well-meaning but forgetful inventor. Laughs explode from the page in this work, which reinterprets classic Japanese adventure manga through Brian Ralph’s trademark style. Come along for a wild ride with Reggie-12, Casper, and Professor Tinkerton as they eat pizza, play video games, and get dissed by bad guys.